Bob Van Liere has been growing and selling irises since 1994. 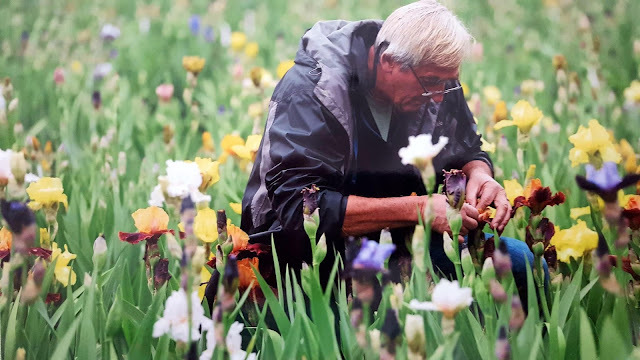 His nearly 3-acre family operated iris garden, Iris4U, is located in Denver, Colorado, as well as Hamburg, Germany, Iris4u Greenhouse, where his daughter, Jennifer, has expanded the family business. 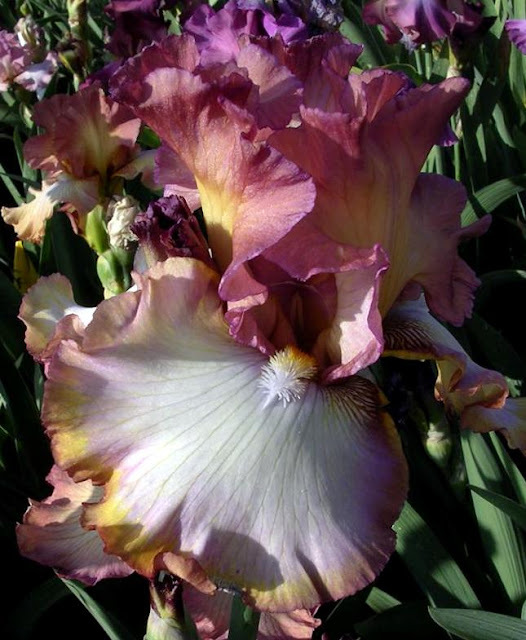 Bob started hybridizing tall bearded irises in 1998, with his first cross 'CASTING CROWNS' in 2005. He says, "When that first cross reached bloom, I just stood there and said, 'Ahh.'" 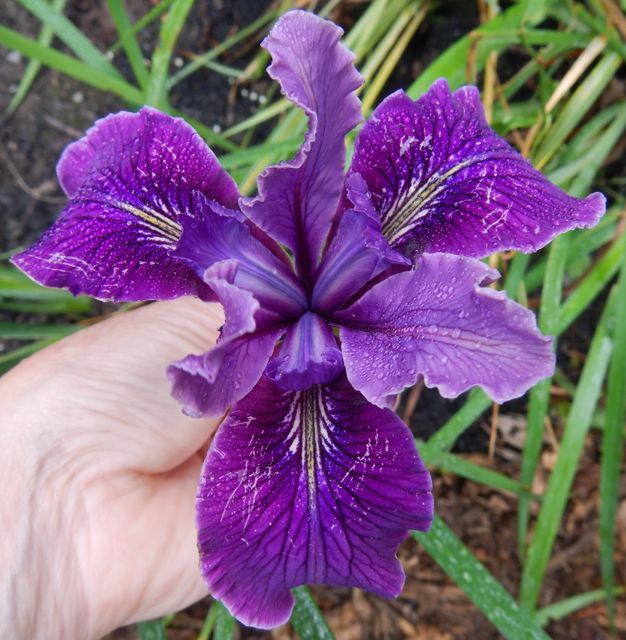 Thousands of crosses and more than 60 introductions later, "Iris Bob," as he is affectionately nicknamed, is still looking for good, vibrant color combinations that exhibit the form, bud count, durability, and unique qualities he desires. 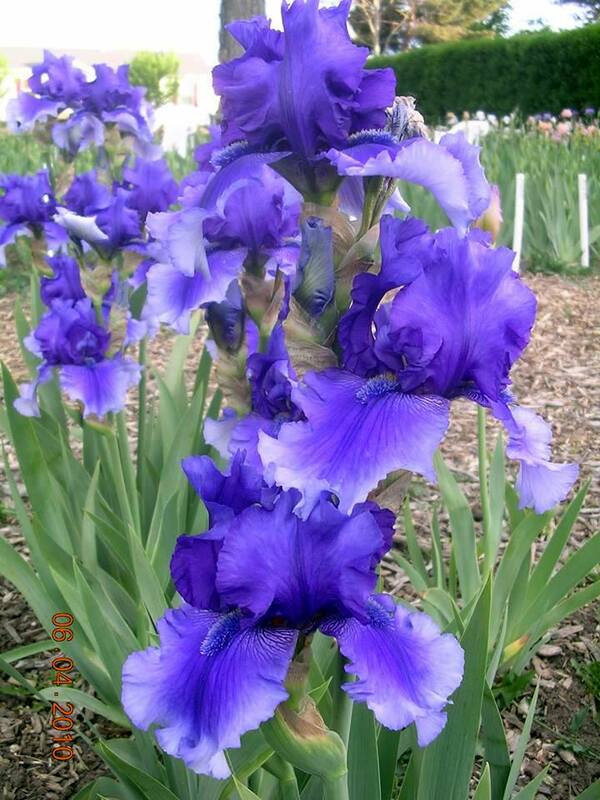 His motto is "Growing and hybridizing tall bearded irises for beauty, performance and your pleasure." This year, Van Liere has been working through a field of 4,000 seedlings bred during the 2012 season. This is their third year in the garden, and he has selected the best 250-300 performers to be dug up and set out again. He'll continue the culling process next year, ending up with maybe 10-20 varieties he thinks are worthy of introduction. The rest will be composted. Bob reports this seedling, coming from his award-winning 2010 introduction 'Stars and Stripes Forever' looks "very promising," saying "it has a beautiful, consistent flounce." If it passes his rigorous standards, this seedling may be introduced soon. 2015 introduction 'MY EMBRACE' is a sister to 'Long Embrace,' 'Embrace Me,' and 'Sisterhood.' Van Liere says, "This may be my favorite of the sisters, as she is bigger and bolder and has a strong salmon coloration." He says "it is probably the slowest grower of the sisters, but it has the largest flower." On a personal note, I am anxious for this luscious-colored 'sister' to bloom next year in my garden, completing the fabulous foursome. Bob says he would say his most popular introduction to date has been 'CROOKED LITTLE SMILE.' He goes on to say "the standards are twisted (hence the name Crooked), but the falls are so intensely colored the average iris lover doesn't care." 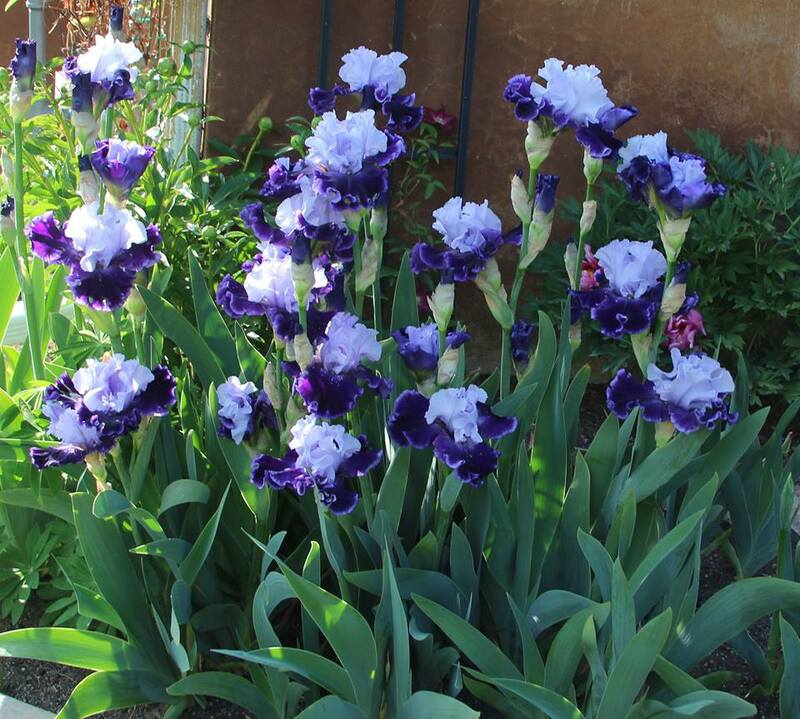 He says "it makes a great garden plant" with its intensely colored deep lavender falls, rimmed in gold. Bob's 2012 introduction 'GLOBAL CROSSING' is a favorite in my garden, and a 2015 award-winning iris. The crisp light blue-violet standards, with its heavily ruffled, deep purple falls, edged with a light blue-violet line is elegant and stunning. 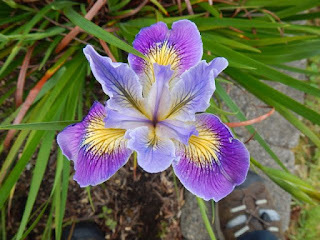 An iris with a long bloom time, it was the first TB to bloom in my 2015 garden, and among the last still blooming at the end of the season. The flower is not only outstanding, but the foliage has lush green, wide, thick fans and is always a subject of conversation with the visitors in my garden. 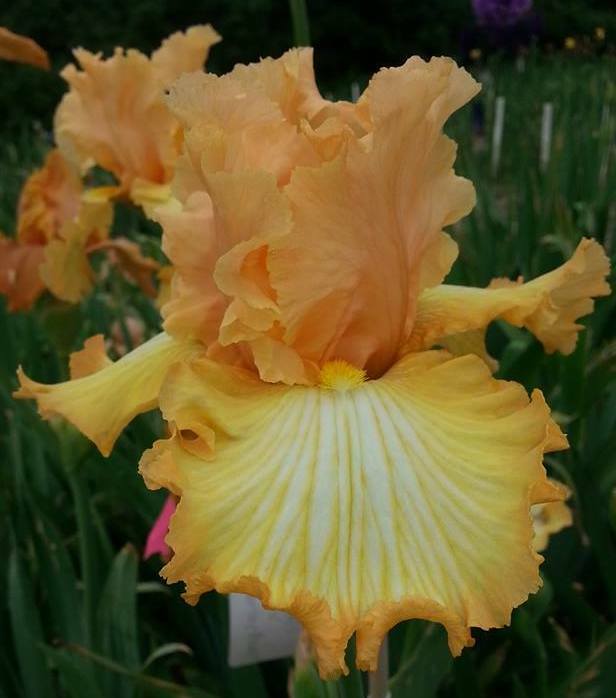 A 2015 award-winning iris,'SWEETER THAN HONEY' (Van Liere 2012) has exceptional color and beautiful form. 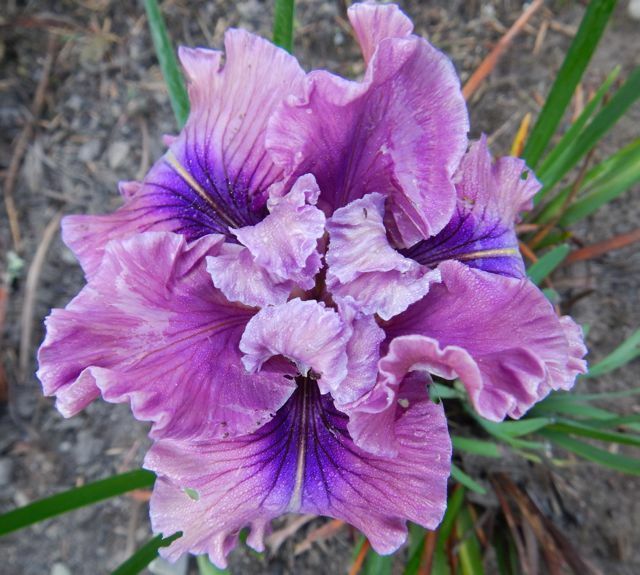 Another popular 2015 award-winner, 'MAYAN MYSTERIES' (Van Liere 2011) has a unique purple waterfall and bright color. Van Liere says this about his 2013 introduction 'BY DAWN'S EARLY LIGHT': "A hybridizer is supposed to like their own introductions, but I really like this one. It has grown on me year after year. It calls me from across the garden. There is a confidence in its make up; it has a garden presence which says, 'Look at me.' "
Seedling 11AR5 (Tying Yellow Ribbons x That's All Folks) is a Mid-to Late bloomer with a "possibility for a 2016 introduction." Bob says "it had 28 increases after its maiden bloom in 2013." He says to stay tuned for her name. Large blooms of 'TICKLE ME PINK' (Van Liere 2011), with it's bright, bushy beards, are long-lasting and a stand out in the garden. An honorable mention in the 2015 iris awards. Striking and prolific 'LONG EMBRACE' (Van Liere 2010). A clump of this is absolutely stunning! Regal 'QUEEN'S RANSOM' (Van Liere 2012). 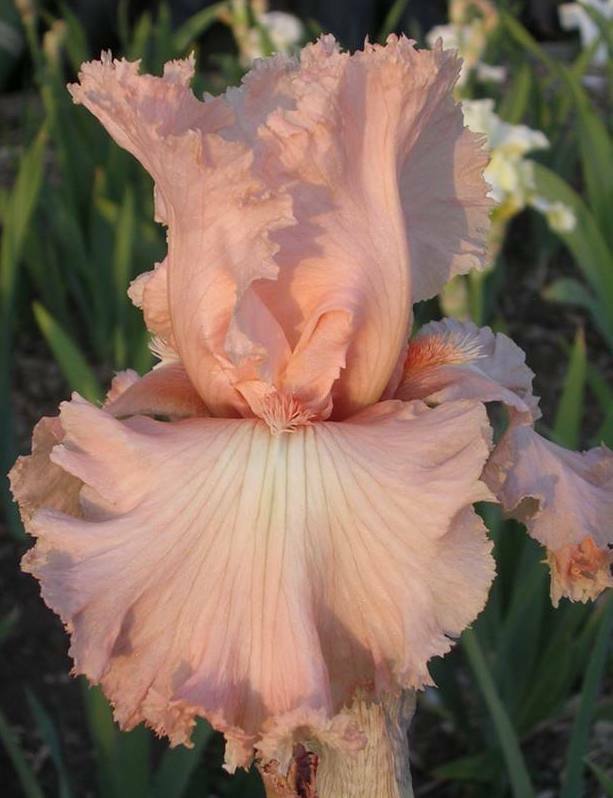 There are always lots of Oooh's and Ahh's over this unique iris. Pictured below is Seedling 24FJ28. Bob may be introducing it in 2016. Hopefully this beauty will pass his rigid standards. I love the rainbow effect on the falls and the yellow glow and rosy edge on the standards. I have the perfect spot for it in my garden! 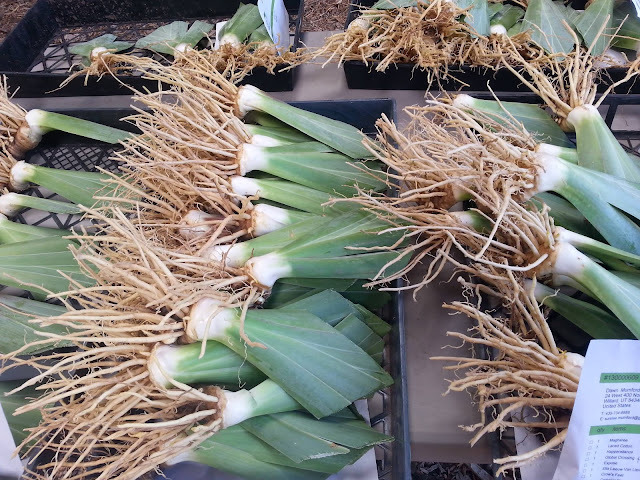 Rhizomes ready to ship for planting. Bob suggests amending the soil with triple super phosphate fertilizer when planting. He fertilizes again in early March, when the flower stalks begin to develop. About 6 weeks after blooming, he fertilizes with a low nitrogen fertilizer. "It can take a decade before a cross is proved to be worthy of commercial introduction. It's a lot of hard work," Bob admits. But I bet if you asked him, he would say it is all well worth it! 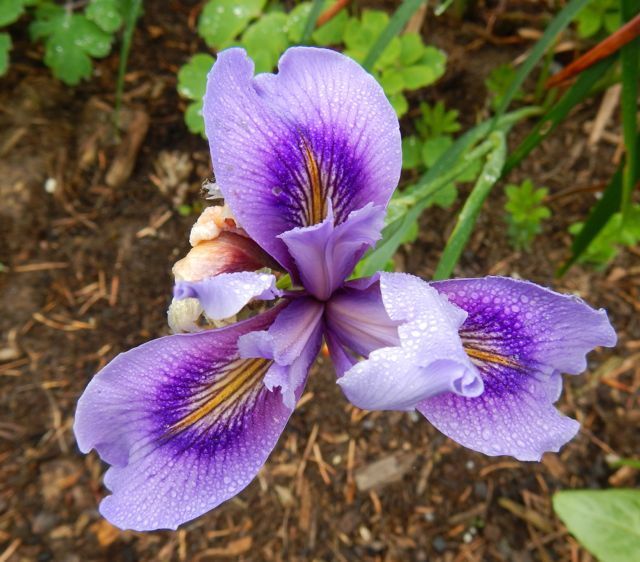 Do you grow any of Bob's irises? Which one(s) are your favorite(s)? I'd love to hear from you! I. brevicaulis is the smallest of this species group. Most stalks are only 12-13 inches tall. The flowers are small 3-4 inches across. The stalks are very zig-zag and tend to lie down. They produce no branches. 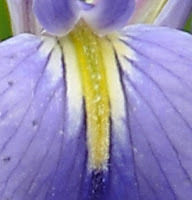 The typical flower is blue-violet with white underlay and yellow signals. They have been found in many varied shades from deep blue to a lavender-blue. Their range is the entire Mississippi River Valley, the Ohio Valley and some of the Missouri Valley. It has been spotted as far north as Canada and around the Great Lakes. As you can see it is very cold hardy. I. brevicaulis do not do well in water. It grows on the field edges and ridges, not in the ditches and swamps with standing water. They do like a lot of moisture though. I. brevicaulis is the last of this group to bloom. Other characteristics are: it grows in full sun, the rhizomes are smaller and it grows on tight clumps. One rhizome forming a clump. One very easy way to tell if a cultivar has brevicaulis in it is the pubescence signal. With the addition of I brevicaulis in the mix we add a lot of new possibilities. OK, so let's explore the good, the bad, and the ugly. The good: Zig zag stalk opens up flower presentation. Tighter clumps makes them better neighbors. They are more cold tolerant so extend the growing range. Bloom later extending the bloom season. 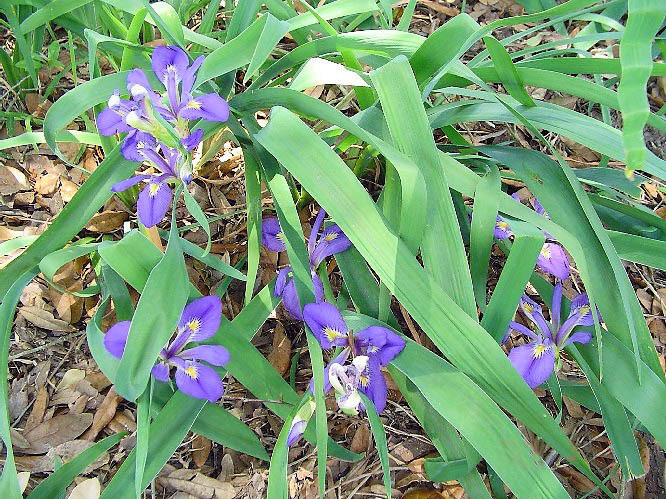 The bad: Flowers open in the foliage and stalks tend to lie down. They do not grow in water so if a cultivar has a lot of brevi in it may not do well in water culture. The ugly: Sorry I have never seen an ugly Louisiana. Jim Murrain had an excellent piece on I brevicaulis in this blog on FEBRUARY 10, 2014. Click here to take a look. Next we look at I Nelsonii. Reblooming Iris Program in Zone 6: "But That's Too Old!" 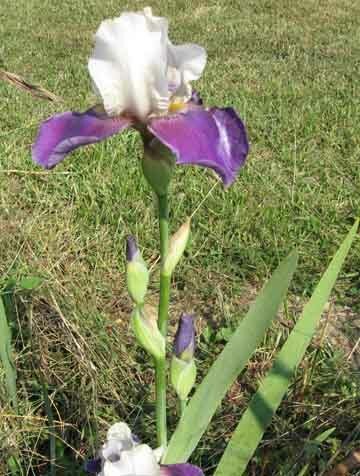 Over the past thirty years, I've grown most of the irises reported to rebloom, and used many of them in breeding. I've produced and grown many iris seedlings that I thought would rebloom, but most have not. 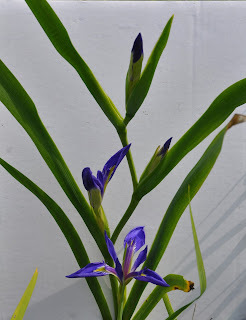 Over the past ten years, as I've tried to encourage others to breed rebloomers, I've often suggested certain strong rebloomers. Ninety percent of the time or more, I'm answered with, "That's to old." or "That's to plain." Of course, they are right, but if we want rebloom, it seems this is the path we must take in zone 6. Most of the rebloomers, introduced in the past thirty years, either don't ever rebloom in my garden, or miss most years. 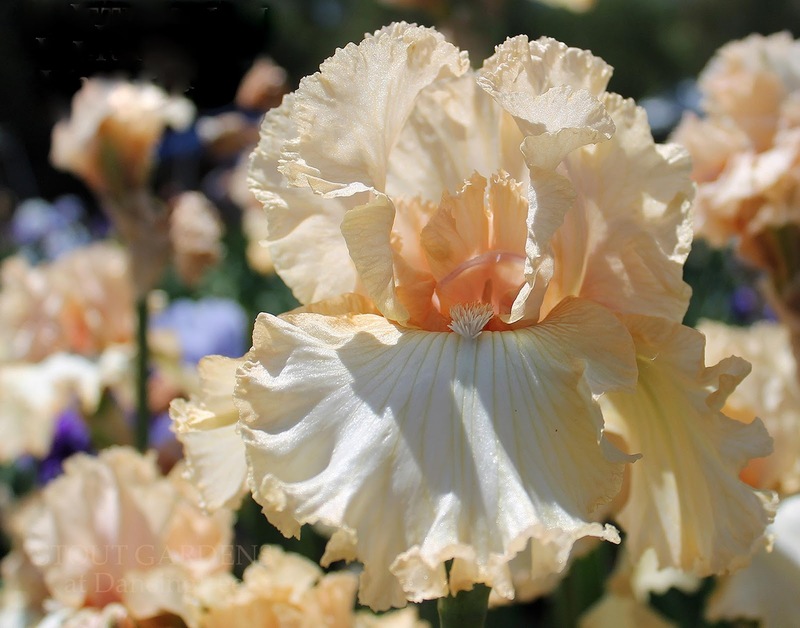 In order to breed rebloomers you may want to use some of the older and more tailored rebloomers. My advice would be to grow a handful of strong rebloomers, and experiment with the crosses. Grow some known rebloomers that are strong in the type of rebloom you want to produce, even fall rebloom if that makes you happy. Add a few good color genes if you can, but know that the closer you stay to strong rebloom, the more rebloom you are likely to get in your seedlings. Mainly, be happy with your crosses, otherwise there is no point. Several years ago, John Van Hook visited my garden on a regular basis, and he often urged me to use 'Blatant' as a reblooming parent. Like everyone else, I didn't want to use it because it was "older & plainer." Eventually, I put pollen from 'All Revved Up' (Wilkerson 2007) onto 'Blatant' (Byer's 1990). I lined them out, fertilized well, and watered on a regular basis. The cross is approximately 75% plicata so I got plicatas, selfs, saturated variegatas, one white with yellow standard rims and fall rims, and one white glaciata. A total of 13 rebloomed, including the glaciata. 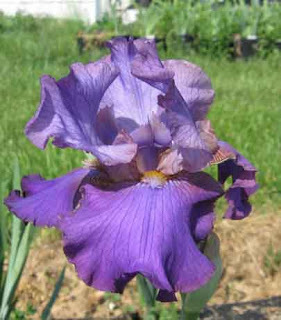 Another rebloomer that I've been reluctant to tell people to use in breeding is 'Violet Returns' by Earl Hall. It's a half sibling to 'Feed Back.' It's both older looking and more tailored, but it produced one of my best reblooming seedlings, 1625-01Re. 'Star Gate' is the pod parent and my 'Violet Returns' X 'Breakers' child is the pollen parent. Again, it's plainer and shorter than desired. Another child of 1625-01Re is just above, 2008-01Re. It's not particularly modern, but did rebloom a lot. Yes, it is hard to get modern form when using these more tailored varieties, but this is where the reblooms seems to reside. Also, rebloom passes most easily when working with plicatas. I've had really good luck with 'Earl of Essex,' and 'Over and Over.' 'Earl of Essex' is good for working with fall/cycle rebloomers, while I expect 'Over and Over' to work better when working for summer/whenever rebloomers. More work with 'Over and Over' is in the future. I've recommended 'Over and Over,' since it's one of the strongest rebloomers I've grown. Most people say they don't want to use it. Few say it's because it's too plain, but don't offer other reasons. The picture above is not one of the best pictures, but does show some of it's potential faults. It would probably be best to make the cross both ways, just to satisfy your own curiosity as to which way is best. If you have better pictures of 'Over and Over,' and you are willing to let me use them in my blogs, please send them to me at bridgeintime@aol.com, with permission to use. Keep in mind that my reports are from work in my own garden in south central Kentucky. I'm on a ridge, above a creek. The garden was a former pasture. Your results may be different than mine. 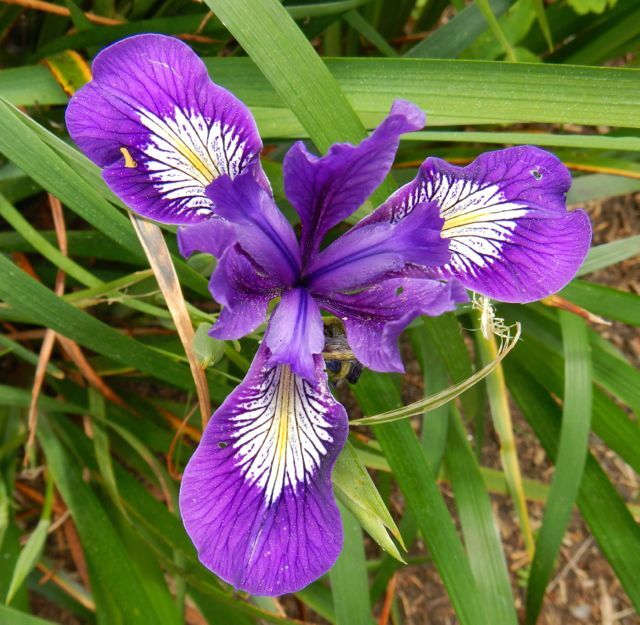 Purple is a common color for many species of Pacifica Iris. Color saturation ranges from pale lavender to velvety dark purple. Many wild populations include lavender to purple flowers. Being a common color, you might think that it's boring. Hmm. Not. 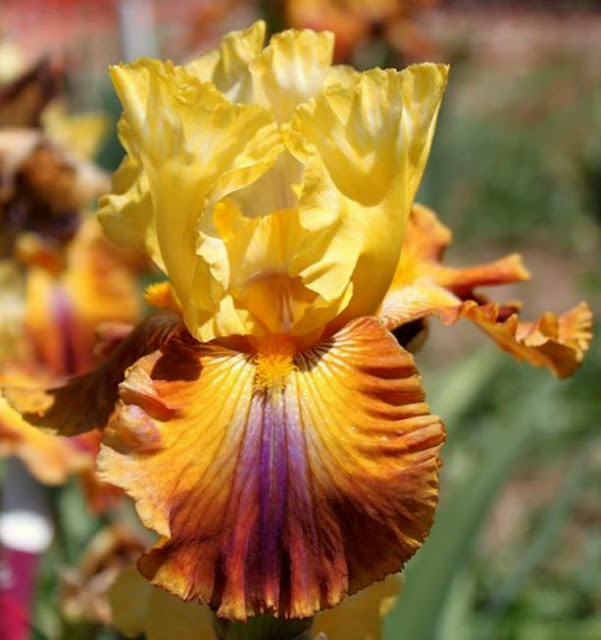 Between hues, shades and saturation, not to mention veins, signals, petal widths, and ruffles, there's a lot to explore, and more to come from hybridizing. 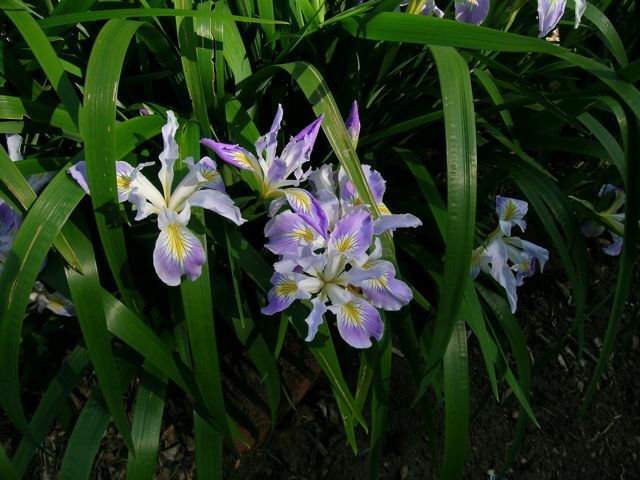 This Iris douglasiana selection is short and blooms at the end of the main flowering period, which is June to early July in my climate. Timing makes up for the plain species-like flowers; when this one blooms, other PCIs are done. As with other flower traits, petal widths, ruffling, signals and veining vary widely in wild flowers and in the garden, where hybridizers continue to push the boundaries on what is possible for iris flowers to achieve. 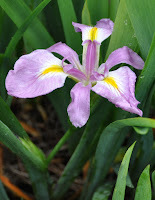 This orchid-purple iris is from Joy Creek Nursery. It was one of my very first PCIs, and is still one of my favorites. It has striking signals with a dark halo and veins on a light purple base, a yellow streak in the white, and the veins extend into the main falls. Sea coast populations of iris douglasiana in northern California include purple-flowered plants. Mendocino Coast Botanic Garden sells seeds from their plants, which grow on the sea cliffs in the botanic garden and seem right at home in my garden, six hundred miles north on Willapa Bay on the south coast of Washington. Similar plants flower hundreds of miles to the south at Pt Reyes, and on down the coast into central and Southern California. These plants are wind, salt and drought-hardy. 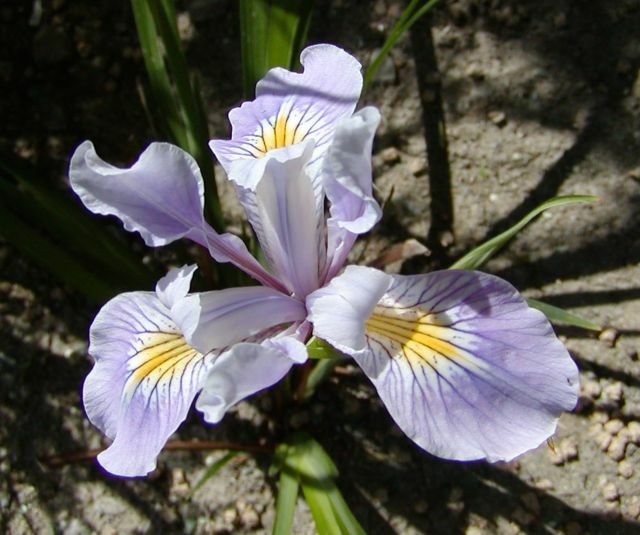 Iris douglasiana, from Mendocino Coast Botanic Gardens, has a small sturdy flower on stems held above the foliage. 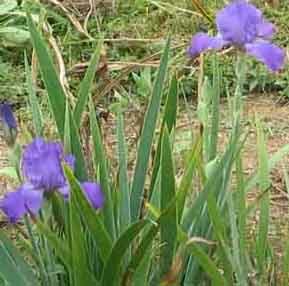 The plant is strong, the flowers are numerous, and the color is a nice medium purple. 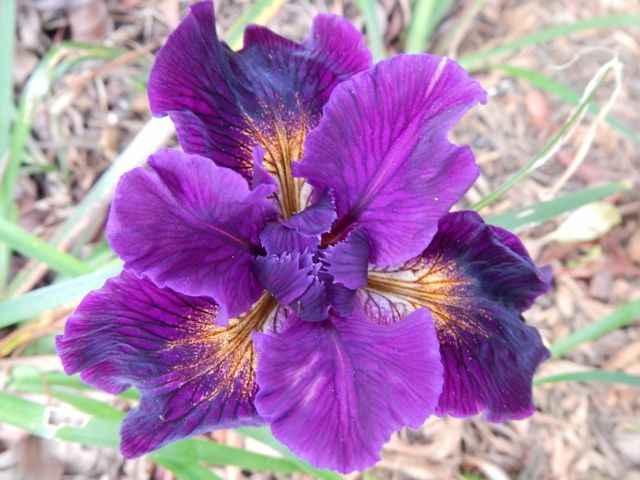 A 'Gravitas' seedling has a large flower with a lovely dark color to the petals. Strong purples show up regularly in open pollinated garden crosses. I've learned to stop growing them all, lovely as each one is, I aim for sturdy plants with flowers held well above the foliage. This flower, above, was a surprise for its size, more than four inches across with nicely wide falls. Another purple favorite is an I. tenax x I. innominata cross, which produced a nice diversity of colorful seedlings, from this purple (below) to white, including some colorful veining variations in between. This I. tenax x I. innominata seedling is one of five variations from the same seed lot, and shows the most purple. 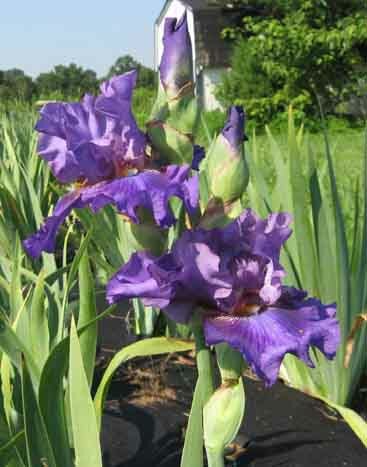 It's a reliable late spring to early summer flowering plant, long after the hybrids are done. PCI 'Valley Banner' was selected by Ruth Hardy from plants derived from a wild population of I. tenax x I. chrysophylla in the south Willamette Valley, in Oregon. Falls are white and heavily veined in dark purple; standards are white with narrow purple midrib; style arms are red purple. PCI 'Valley Banner' is a well-veined, bicolor combination. This photo was taken by Debby Cole. I've mentioned petal widths before, and here again are some of the variations, from wide and ruffly to narrow. This seedling is almost pink, with a striking purple signal and central pale slash. The ruffles are over the top. This is a PCI 'San Benecio' seedling. A neighbor showed me his PCIs this spring, and this lovely narrow-leaved specimen grew with more typical I. doug-type flowers. Why do I like narrow petals? They often hold up well in wet weather. 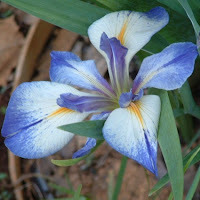 Will Plotner's PCI 'Wild Survivor' is a species-like hybrid with lavender flowers, slightly darker veins on the falls, and a white and yellow signal. This hybrid was a Mitchell Medal Winner a couple of years ago, see below. 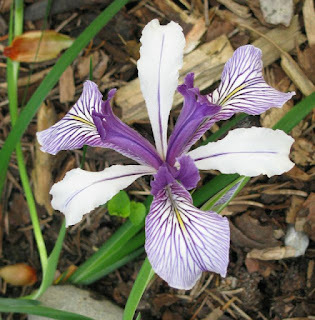 PCI 'Wild Survivor' is a lavender hybrid with a species-like appearance. This can be very refreshing among highly ruffled and intensely colored selections. Photo by Richard Richards, from the SPCNI photo collection, thanks to Ken Walker. A maiden flower on a seedling from PCI 'Earthquake' at the south end of the yard was a lovely dark purple. The falls are velvety, ruffled, and intensely colored, with rich dark veining over the background color. Then there is the impact of dark veins on light backgrounds, and complex signals, touched on initially with Joy Creek's orchid PCI, and again here, below, with a hybrid from Southern California. 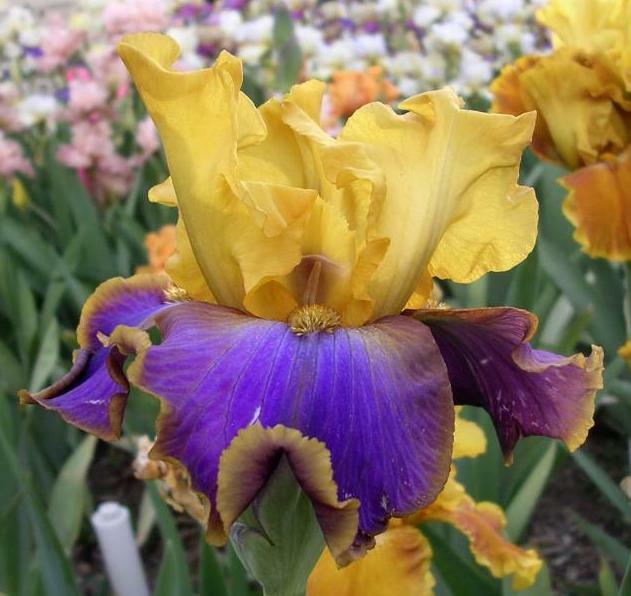 PCI 'Daria' has a light purple background, intense veining on falls and a large yellow signal; it's yet another variation on purple. The take-home message about purple is that this color encompasses a wide range of hues, shades, saturations, and petal forms. As a foundation color PCIs, new variations will keep appearing for years to come. 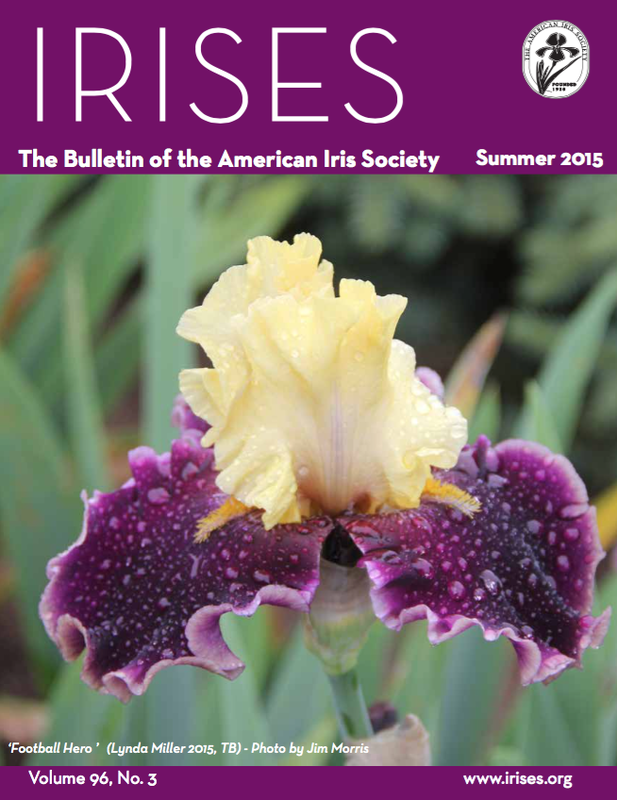 Hot off the presses, here's the Summer Edition of IRISES, the Bulletin of The American iris Society. On the cover, 'Football Hero,' a fantastic new introduction by hybridizer Lynda Miller and top favorite iris chosen during the Portland National Convention. For all Favorite 15 Guest Irises of the convention, please see page 34. The Summer 2015 issue of the AIS Bulletin is now available for online viewing within the Emembers section of the AIS website. Note: to access this area of the website you must have a current AIS Emembership. AIS Emembership is separate from the normal AIS membership. Please see the Electronic Membership Information area of the AIS website for more details. A fantastic edition, this time focusing on the National Convention held in Portland, Oregon. 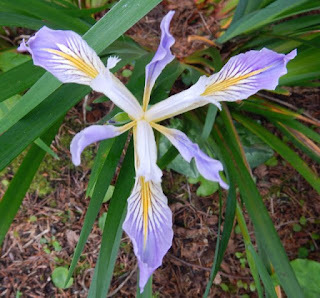 One of the most detailed convention descriptions I've seen in recent years, it covers everything that a gardener/attendee would want to know, from the the pre-convention gardens and their uniqueness, to details of irises and updates on hybridizers' current developments. From this land of many iris wonders you will enjoy a full 10-pages of pure iris talk. And for some welcome news, Bonnie Nichols writes a detailed article about the newly formed Novelty Iris Society of which she's President, on page 11, with information regarding the selection of the first officers and directors, a list of committee heads still needed, and the many ways to help the new Society. You will find the article on the announcement of the 2015 Winner of the Bennet C. Jones Award for Outstanding Median Hybridizing, Jean Witt, both inspiring and stimulating -- on page 13. Jean Morris, explains on pages 38-39 of the section Another Day in the Garden why Siberian irises are her favorite, and how she glad to seeing these beauties at the Portland Convention. I must say that I feel the same way as Jean, I cannot grow them in my area, but oh boy I love to see them when I can. 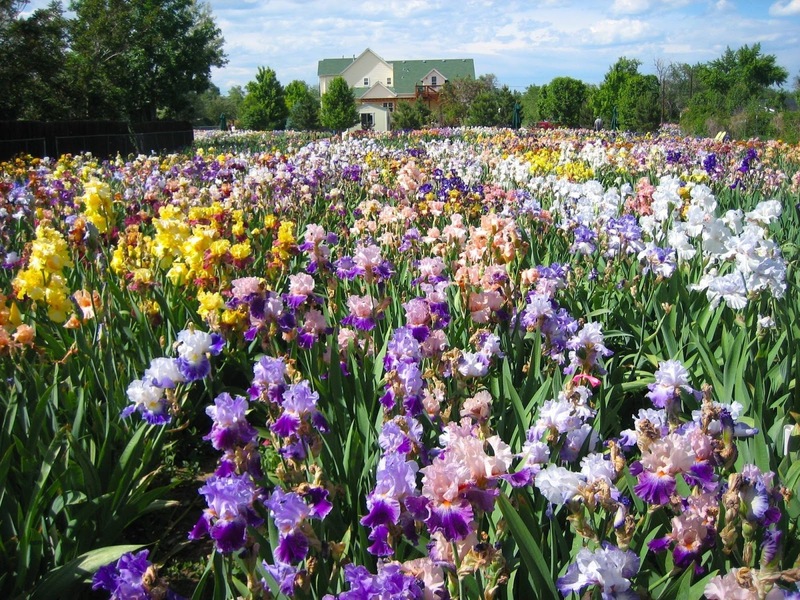 Don't miss the buckets-full-of iris blooms from Schreiner's Iris Gardens, on page 3. I couldn't believe my eyes on location. Only at Schreiner's. The Bulletin's section Youth Views is on page 8 and the encouraging essays by youth members, and Ackerman Essay Winners, on page 9. If you like reading mystery novels, the nonfiction story by Aaron Floden and James Waddick will surely please you. Is set in a land of many eccentricities and contracts, and the line of captivating characters are looking for a majestic prize. Don't miss The Long Road to a New Iris in India -- Part 1, on pages 50 - 51. Congratulations to Jim Waddick from Missouri for winning the 2014 Michael Foster Memorial Plaque announced and bestowed by the British Iris Society. Read about it on page 14. On page 62, towards the end of the Bulletin find the invitation to next year's convention. Although not mentioned in IRISES due to publishcation deadline restrictions, please note that the 2016 National Convention website is out. Going Eas in 2016 will be held in Newark, NJ. Click on the link for more information. 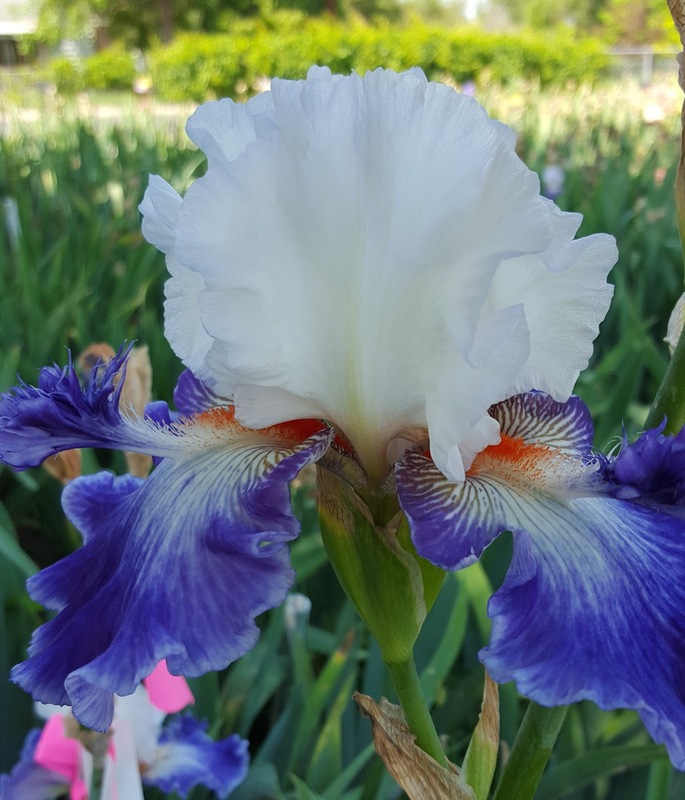 AIS President, Jim Morris, continues to inform us about Irises Down Under & New Zealand, with his Part 3 of what seemed like a trip of a lifetime. 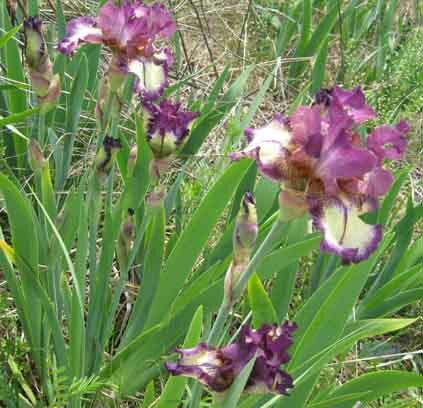 The combination of two splendid beauties, nature and irises, really makes it a special trip, don't you think? There's a lot more to see and read in this edition of IRISES, either in digital or print formats. I hope you are an AIS member because that means that you will receive the print edition soon (it's in the hands of the Post Office), or if you are an e-member, then that version is already available online as mentioned above. 1. I made an album where I keep all the pictures and descriptions of the irises. 2. I make digital scrapbook pages that I can upload to a printing company to be made into a book. 3. I make collages for later enjoyment. 4. 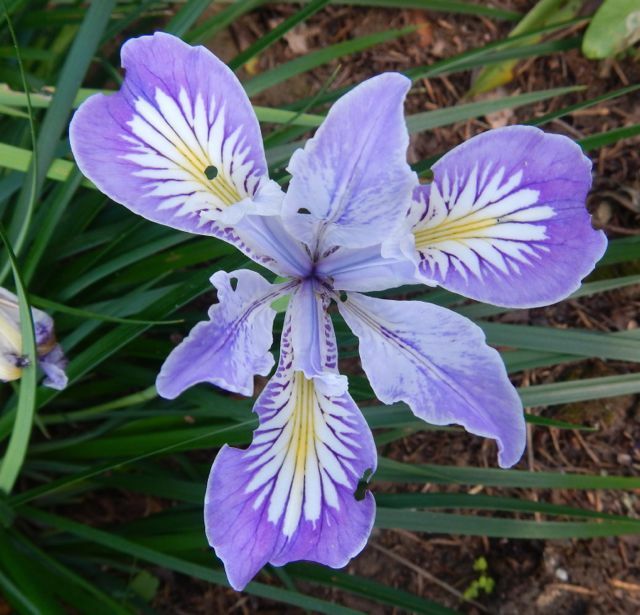 I love to make iris slideshows set to music that can be played on my T.V. year-round. 1. 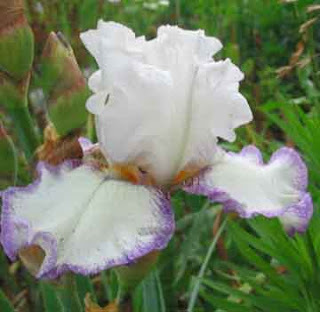 The album: I started collecting and growing irises in the mid 1980s. I cut photos out of older catalogs and put the photos and the descriptions in an album to help me make comparisons and double check my maps. This is an important garden reference book, but I also enjoy just looking through it. 2. Digital scrapbook pages and self-published books: I have used both Mixbook and Picaboo publishers and have had good results with both. Sometimes I like to create the pages in the scrapbook section of the Smilebox software and then save them as jpg's or jpeg (jpg stands for Joint Photographic Experts Group). It is a common format used for storing and transmitting photographic images on the World Wide Web. When Mixbook or Picaboo have a sale, I go to the site. When it asks me to upload photos, the pages have already been created (with art and embellishments). All I have to do is upload them. Here is a sample page made in Smilebox but saved as a jpg ready to be uploaded to a company that prints books. This process helps make your books look more professional. Pages can hold 1, 2, 3, 4, or 5 photos, but of course, the photos will be smaller each time one is added. Susanne Spicker has used different companies with success. 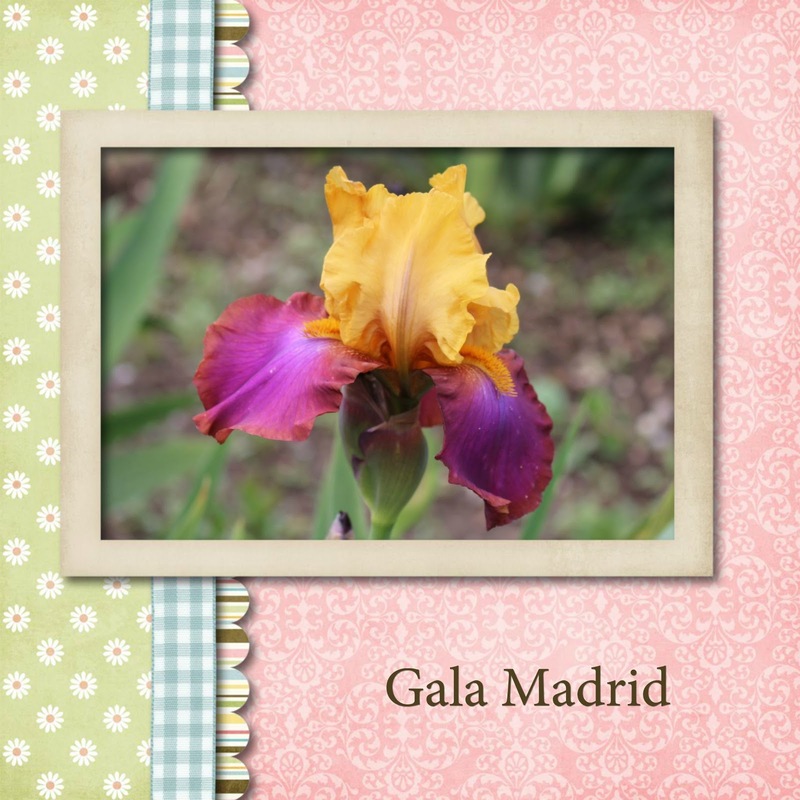 She has produced beautiful iris books, garden books, and even flower arranging books. (Perhaps if we are lucky she will show some of her books on one of her posts here.) The books can be hard or soft cover and are generally not too expensive unless they are very long. Once you get started, some of these companies e-mail you when they are having a sale. Costco and Walmart also make good photo books, but I have had better results with my local Walmart than I did uploading the files to the main Walmart company in another state. (Uploading is a process that these companies use to take copies of your picture files off your computer and put them on theirs so that they can print your book). Don't worry, you control what files they have access to. This book has pictures on the front and back of the hard cover. 3. Collages: I love to make digital collages. They are easier than they look, especially after you have made the first one. I use the free software called Picasa from Google. 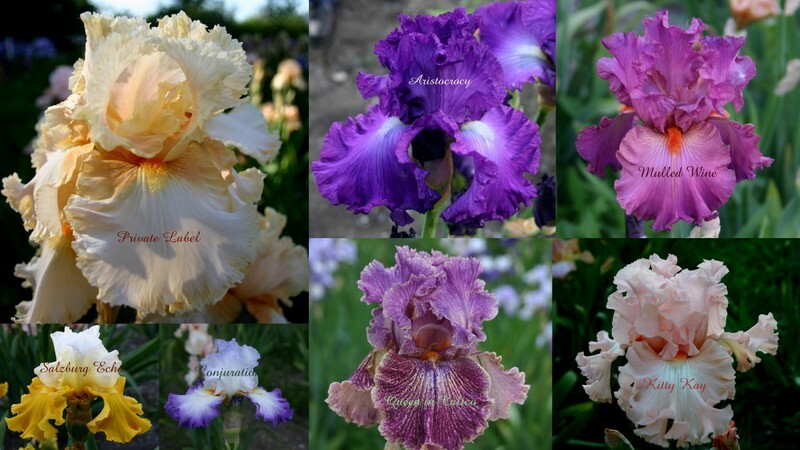 The irises above are 'Private Label' (Nelson, 1985), 'Aristocracy' (Keppel, 2005), 'Mulled Wine' (Keppel, 1981), 'Salsburg Echo' (Schreiner, 2009), 'Conjuration' (Byers, 1988), 'Queen in Calico' (Gibson, 1979), and 'Kitty Kay' (Keppel, 2002). These collages were made with Picasa. 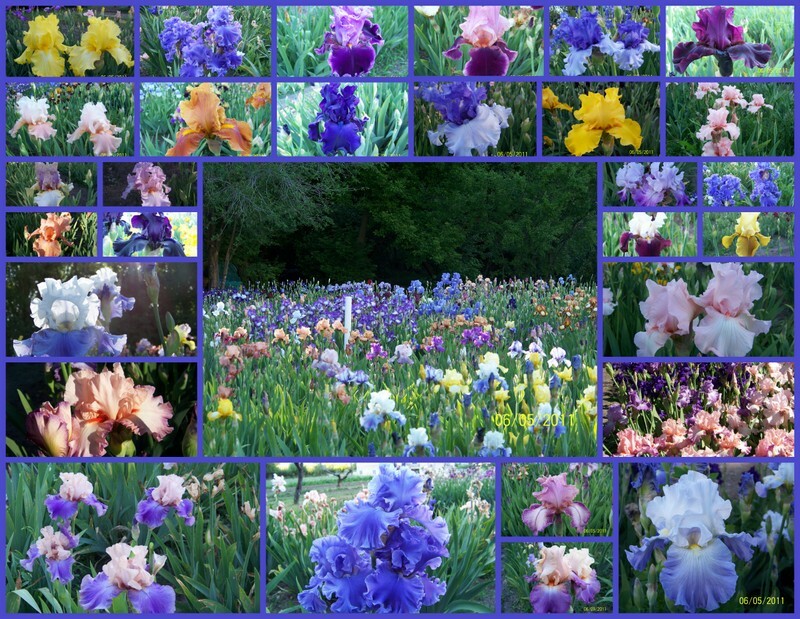 It is a fun way to enjoy looking at your iris all through the year. You can even upload these collages and have them printed in a photo book. 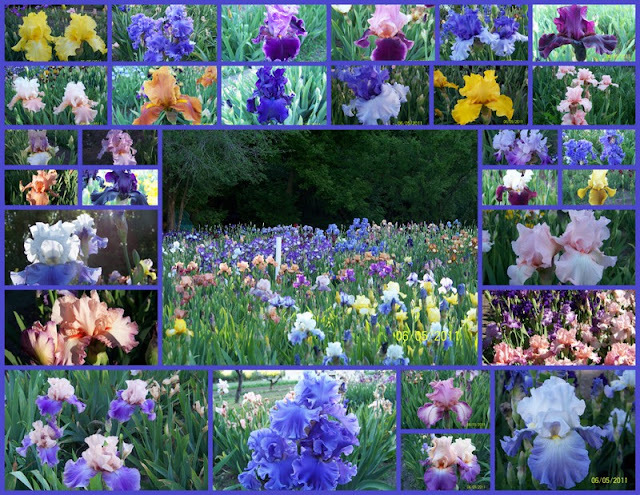 There are too many irises in this collage to name them all! 4. Compact disks that can be played on the T.V. : The slideshow disks that I create for T.V. are made with Smilebox software. It is really pretty easy, but it takes some time to find your pictures, decide which photos to use, and to add the captions. The art work in Smilebox is already created and you just pick what you like. Some of the introductions even include animation. This company is making new designs all the time. Another fun thing is that you can set your slide show to music to add to your enjoyment. Smilebox has lots of music to pick from, or if you have some already stored on your computer you can use that. 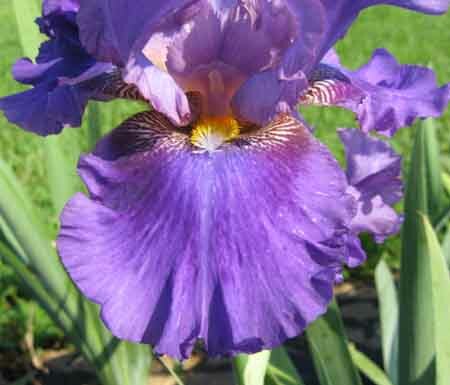 To see one of my iris slideshows adjust your speaker volume for music and then click 5 minute Slideshow. 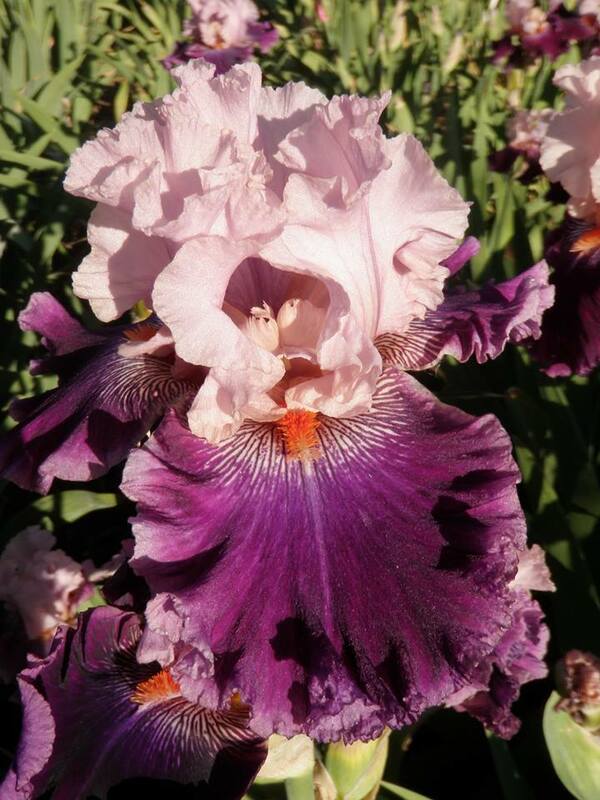 The show has 50 photographs taken in our iris patch. 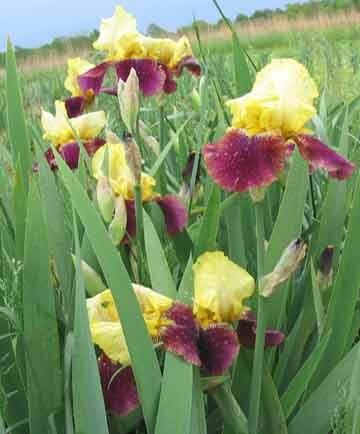 They are tall bearded irises, historic and new, in no particular order. You can stop the slide show at any time by pressing the "Esc" button on the top left of your keyboard or the "X" button at the top right of your screen. If you want to hear all three songs in the show slide the cursor across the iris while the slideshow is running and white letters appear; click on the rectangle to the right of all the white letters; when you click, it will allow the show to loop and play over and over until you stop it. When the slash line is through the box it will not repeat play. P.S. 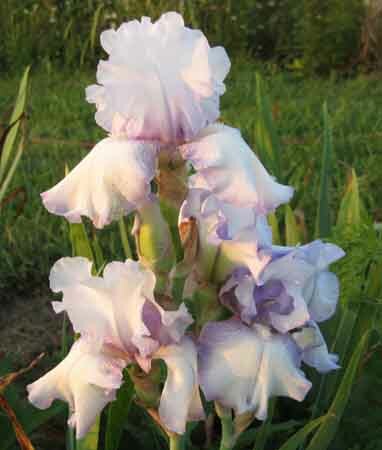 I’m often asked if I sell or trade my irises. I’m sorry but I don’t. My husband has Alzheimer’s disease and he does all the digging and takes care of our orchard (and me!) and I can’t ask him to do more. I can give you the name of the iris, the hybridizer, and the year of registration (for most) so you can order your favorites. I do keep rows of irises for sharing, and I give those away to people who come to the garden while they are blooming, usually around Memorial Day, but I do not sell them.